Goals: C. Reynolds 4, M. Williams 4, R. Dolliver 2, S. Young 2, P. Manassa 2, N. Clark. Best: W. Dunne, G. Hunnibell, B. Zelesco, M. Williams, J. Anthony, C. Reynolds, A. Downes. Goals: R. Jessop 4, J. Radojevic 3, B. Jones 2, G. Milroy 2, T. West, Jim Christou, R. Herbert, T. Wilkins. Best: A. Aanensen, B. Jones, R. Jessop, John Christou. The Tasmanian Football Hall of Fame ‘Memorable Game’ for 2015 is the 1981 interstate match between the Tasmanian Greater Northern League (GNL) and the Victorian Football Association (VFA). 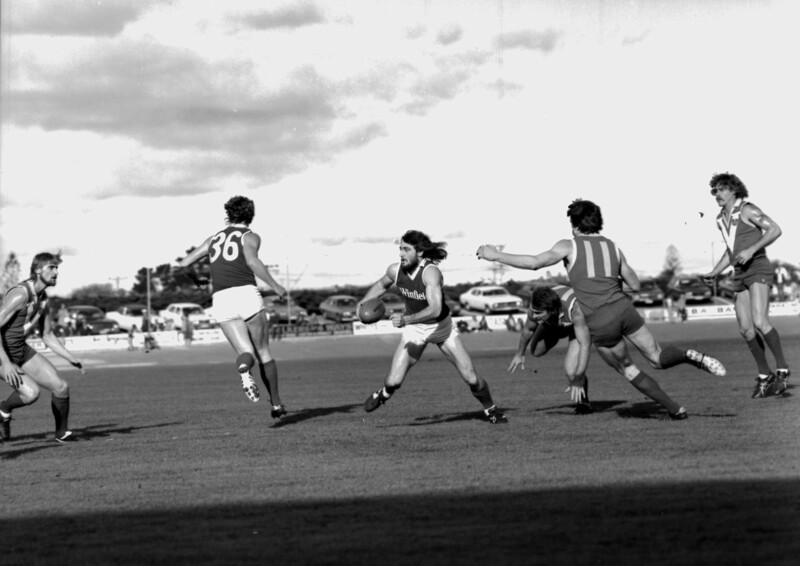 1981 was a year during which Tasmanian football was at internal loggerheads, with regional politics and prejudices dictating that the best players in the state were not playing in the same competition. As a result, the southern Tasmanian-based ‘Tasmanian Football League’ determined that it would not select players from the two northern Tasmanian-based senior competitions, the NTFA and NWFU, for state representative honours. Even the Tasmanian coach from the previous season, Launceston-based Peter Daniel, was overlooked. In response, the leaders of the NTFA and NWFU determined to select a combined representative team (using a sponsor branding) labelled the Greater Northern League (GNL) when they challenged the Victorian Football Association (VFA) to an interstate match at Devonport. The VFA had visited Tasmania the previous year and annihilated an NTFA combination by 121 points. In 1981 the Victorians again arrived in Tasmania with a very talented team, twelve of whom had either played, or would go on to play, VFL football, including vice-captain and dual J.J. Liston Medallist Vic Aanensen and 103-game Essendon/Richmond half back, Gary Parkes. The VFA had also committed significant resources to the team’s coaching by Mick Erwin, who would go on to coach Collingwood in 1982 in the wake of Tom Hafey’s sacking. The GNL had likewise assembled a strong side, with seven representatives from the powerhouse North Launceston side of the era, but even so the task of toppling the powerful VFA outfit was a tall order. To make matters worse, star Ulverstone rover and former 246-game VFL champion John Murphy injured his hamstring in the final training session and was subsequently ruled out of the match, leaving North Launceston ruckman Graham Hunnibell to lead the Tasmanian outfit. It was a bitter blow for the GNL; Murphy was in outstanding form and would go on to win the NWFU Best and Fairest award at season’s end. Many pundits tipped that the VFA would have few problems dispatching a Tasmanian side for the second consecutive year. In front of 3,500 spectators at Devonport Oval, the match seemed to be following the script for the Victorians early on. With Joe Radojevic and Russell Jessop proving handfuls around goal, the GNL found themselves as much as 39 points behind early in the second quarter. While the VFA were playing exceptionally well, the Tasmanians had had plenty of the play, though their cause was not helped by a shocking fit of inaccuracy which left them with a score of 4.11 (35) in the first half in opposition to the VFA’s 10.2. Unless the Tasmanians could convert their chances in the second half the match was as good as over. With a 27-point half time deficit to reign in, the GNL had an enormous mountain to climb. Coach Peter Daniel, desperate to regain control of the match, rang no less than 11 changes in an attempt to shift the momentum. The effect was instant and devastating, and the third quarter that played out was labelled by the media of the day as “arguably the best in Tasmanian football history”. With captain Graham Hunnibell and Bill Dunne dominating the ground and their forward line beginning to function more effectively, the GNL slammed on 8.7 to 2.5 to turn the match on its head, entering the final quarter with an 11-point lead. The final term was a titanic arm wrestle. The VFA outscored the GNL 3.3 to 3.2, but this was not enough to reel in the Tasmanians, who recorded a famed 10-point victory. The VFA’s loss was their first against a Tasmanian combination since their defeat at the Australian National Carnival in 1966. East Devonport full back John Anthony was unanimously hailed as the best player on the ground, while big men Hunnibell, Mark Williams and Chris Reynolds also made an enormous impact in the second half. It was universally agreed, however, that it was a magnificent team effort that had lifted the Tasmanians over the line. In the aftermath of the victory the GNL invited the TFL to play an intrastate representative match. The TFL declined, ostensibly because it was not possible to find a suitable date, but most northern football supporters believed it was because the TFL did not want to risk the possibility that the best footballers of 1981 had been overlooked for ‘official’ Tasmanian team selection because of the footballing politics of the day. One of the most famous wins in the history of Tasmanian interstate football and a classic ‘David vs. Goliath’ triumph, the 1981 Greater Northern League victory over the VFA is a worthy inductee into the Tasmanian Football Hall of Fame.